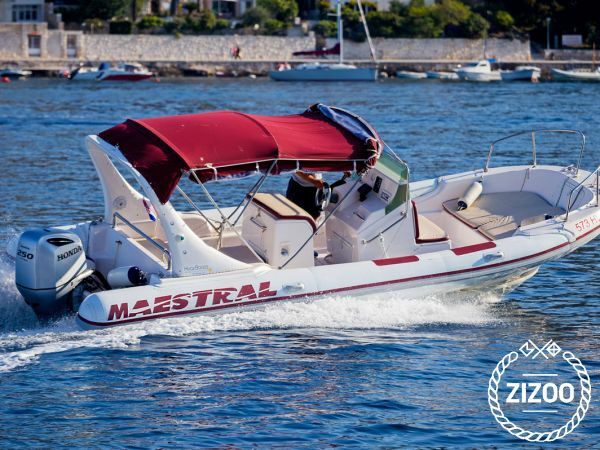 An inflatable Maestral 745 rib powered by strong 250 HP Honda engine offers completely different approach to cruise and adrenaline dose for active travelers. Its 7.45 meters length easily provides comfort accommodation for 12 persons. Hard fixed sun shield creates shade during the warm days and possibility of closing the boat with specifically designed side plastic awnings keeps passengers dry even during the top-speeds. This boat is perfect for larger groups and adventure seekers, so grab your friends and family and start an adventure! Headed to some of our islands like Vis and Brač you can enjoy swimming in our crystal blue sea, and try some local food. Dont forget to enjoy the sun on the most sunniest Croatian island: Hvar. Boat is equipped with all the necessary coast guard approved safety equipment. INCLUDED: - skipper - snorkels - icebox - light drinks - insurance of passengers - music - pick up, drop off NOTE: Petrol is not included in the price.